Two female victims critically and moderately wounded in attack by 2 terrorists at supermarket in Beit Horon; 3 bombs found at scene. Two women were wounded - one of them fatally - in a stabbing attack that took place on Monday afternoon near Beit Horon, located to the northwest of Jerusalem in Samaria's Binyamin district. The two terrorists who conducted the attack, in which one victim was critically wounded and another moderately wounded, were shot by a security guard and later died of their wounds. An improvised explosive was found shortly afterwards adjacent to the scene of the attack by security forces. A police bomb-squad member was rushed to the scene to dismantle the explosive, and residents were asked to stay indoors. Shortly afterwards a second explosive, described as a pipe bomb, was also located, followed shortly afterwards by a third explosive device discovered nearby. 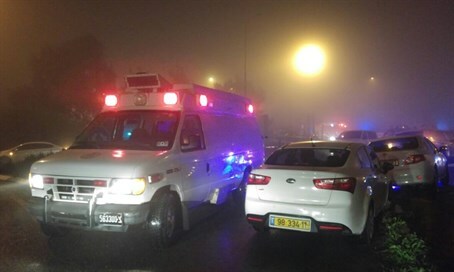 Magen David Adom (MDA) medical crews rushed to the scene and provided treatment to the victims; one is critically wounded and the other moderately. According to MDA, both victims suffered stab wounds to the upper body. The victim in critical condition is aged 23, while the moderately wounded one is aged 58. The critically wounded victim was evacuated to Hadassah Mount Scopus Hospital in Jerusalem for continued treatment, but subsequently succumbed to her wounds. The other victim was likewise evacuated to the Shaare Tzedek Hospital in the capital. An initial investigation has revealed that the two terrorists arrived at the supermarket in Beit Horon where they stabbed the two women. A security personnel member shot them outside the store and neutralized them. Senior MDA medic Lior Levy said, "when we arrived on scene they led us to a woman...she was unconscious and suffered stab wounds to her upper body. We put her in the emergency care vehicle and while giving her life-saving treatment started to evacuate her to the hospital, with her condition very serious." Another senior medic with MDA, Zevulun Keyti, said, "we reached a 58-year-old woman, she was fully conscious and suffered stab wounds to her upper body. While giving her medical treatment including stopping the bleeding, bandaging the wounds and providing fluids, we evacuated her to the hospital, as her condition was classified moderate."